Advocacy group Toronto Stop the Cuts, who say they “are building grassroots structures that will be prepared to defend [against] cuts to local services if and when they happen in the months and years to come,” issued a news release today that suggested the City was trying to prevent a meeting planned for Dufferin Grove Park tomorrow from taking place. 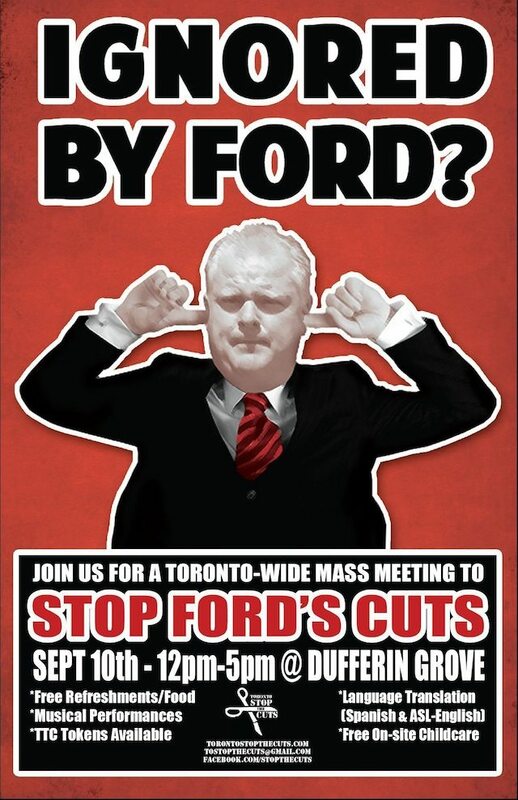 In a blatantly anti-democratic move that smacks of Rob Ford’s authoritarianism, Toronto City is attempting to stop the Mass Meeting to Stop Ford’s Cuts from taking place. The city is shutting down Dufferin Grove Park, where the meeting is scheduled from 12pm to 5pm on Saturday, September 10. We called the City’s Parks, Forestry, and Recreation division and spoke to PR manager Graham Mitchell. He told us that the City was aware a large protest was taking place at the park, but since there was no permit for the event, they did not know what to expect. “We don’t have the information to ensure staff are working under safe conditions,” he said, and so the City cancelled planned gardening and composting work, as well as seasonal cleanup and maintenance, “to ensure staff safety.” He said the park’s snack cart will not be open, and, since the sand pit won’t be supervised, the water will be turned off. However, the park’s washrooms will be open and City staff will be on hand preparing food for the following day. He said services will resume after the event wraps up. Stop the Cuts organizers say they are expecting thousands of residents to attend the meeting at Dufferin Grove.